Welcome to Friedman LLP. We provide professionals with unique opportunities to grow professionally regardless of the stage in their career in which they are joining Friedman. 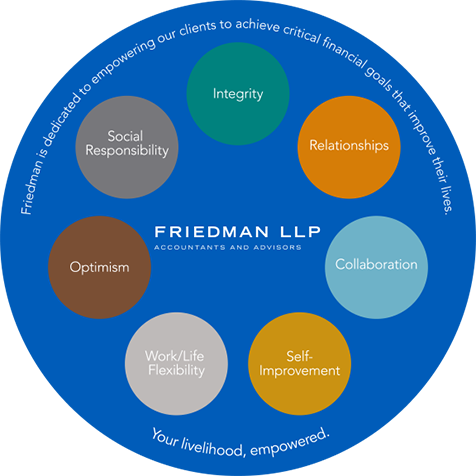 Friedman offers all the resources of larger firms while helping you achieve a balance between professional success and a fulfilling personal life. Established in 1924, Friedman LLP is a top-20 regional accounting firm headquartered in New York City, with regional offices throughout New Jersey including East Hanover, Marlton, Linwood and Toms River. We also have offices in Uniondale, Long Island and Philadelphia. Internationally, we have a location in Beijing, China. Friedman has been named one of the Best Places to Work by Crain’s NY and NJ Biz. man, but we know the number one reason because we hear it every day, "Great People!" Friedman LLP was ranked #2 in "Best Places to Work on Long Island 2018"